Mamma’s Juicery is a local juice and smoothie bar in Monrovia. Our team went to their ribbon cutting when the store first opening and the owners came to us to have their menu redesigned. The challenge for our designers was to create an eye-catching and organized menu while still staying on brand. The existing menu had no design and just a lot of text on white background. A restaurant’s menu is one of the most important internal advertising tools that can be used to educate a guest about the experience they are about to have so it’s crucial for our designers to create a menu that expresses the personality of the restaurant. The first thing our team did was to go out to the location to understand the client better. The store itself is very bright, colorful and welcoming and our designers wanted to make sure that these feelings would also translate into the menu design. Because Mamma’s Juicery is focused on healthy living, our designers wanted to incorporate a lot of fruits, veggies, and organic colors. Our designers organized the content so that customers could have an easy time deciding what to order. On one side of the menu, our designers organized the “build your own smoothie” on one side of the trifold, dividing the page into three sections to make it easier to read. In addition, the menu has a lot of photos and icons to help break up all the information. 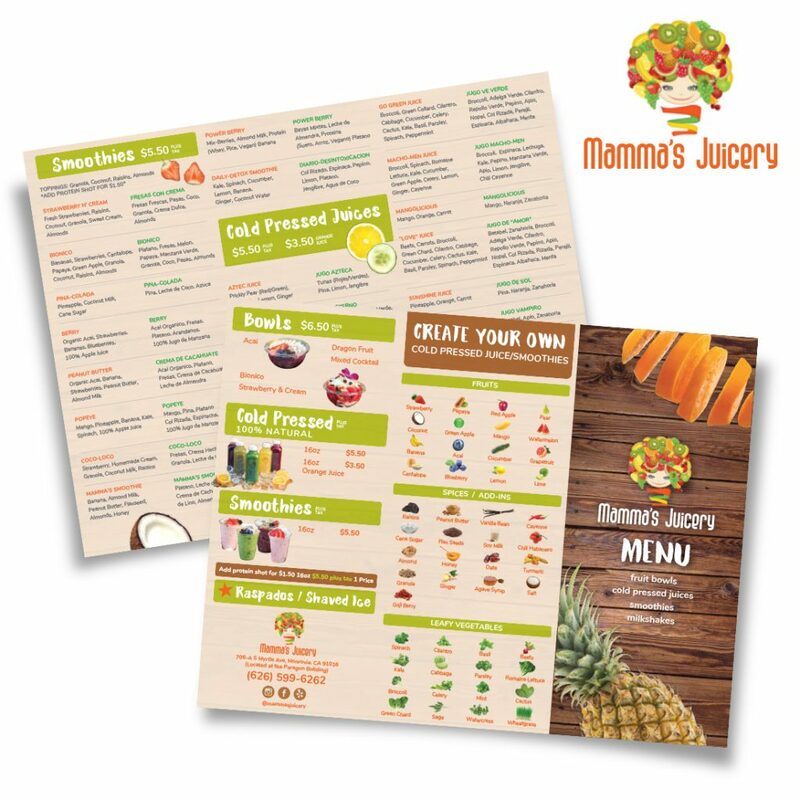 Our designers used tan and green predominately throughout the menu as well as fun fonts to convey the atmosphere of Mamma’s Juicery, a local fun and healthy spot that you’ll want to come back to. Does your business need a new menu designed? Or perhaps business cards or flyers? Our experienced team can do it all! Contact us today.